Happy Tuesday! It's back to work for me, but I rather be at home crafting. This month I am guest designing over at Skipping Stones Design. You must check them because they have some extremely great stamps that are are both cute and funny. For my card, I am using the Grudge stamp set. 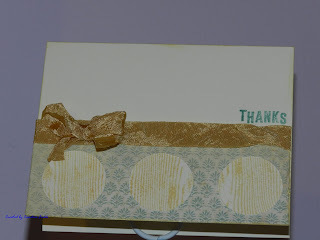 I stamped the wood background using Creme Brulee ink and punched out the circles using a 1 3/8 circle punch. Using Juniper ink, I stamped the sentiment Thanks. The card base is Colonial White and I sponged the edges with the Creme Brulee. I used some pattern paper from the Typeset paper pack and used a distressing tool around the edges. Lastly, I added some crinkle ribbon to finish off the card. PMS(Purchase More Stamps) sale starting Sunday.....going through Sunday the 22nd at midnight. Here are some of my favorites sets. This is beautiful Candace. I love seeing all of your SSD creations!!! I hope you have a good week! !